When Albert Einstein published his special theory of relativity in 1905, perhaps the most jarring conclusion drawn from his new vision of the universe was that time itself does not pass at a constant rate. Instead, Einstein showed us that the speed of time is dynamic, and reveals itself to individuals in unique ways, depending on their reference points and interaction with gravity. I sometimes wonder what it would be like for a discovery of similar magnitude to occur today. As writers, how would we respond to this opening of Pandora’s Box, which would offer some fresh vision of life untapped by our literary forebears? It is enough to make a modern sci-fi fan salivate. But luckily, Einstein’s own breakthrough was dense enough, and beautiful enough, that a century later, our imaginations still run wild with this concept of time in drift. For Gavein Throzz, the nucleus of Marek S. Huberath’s Nest of Worlds, the laws of time are becoming a serious nuisance. His world is one that might make even Einstein’s head spin, where the rate of time is derived entirely from a person’s distance from sea level, and the range of speeds is brutally unforgiving. Gavein and his wife, Ra Mahleiné, have just arrived in Davabel, one of four “Lands” spread across their Earth-like planet. However, Gavein traveled by airplane and reached his destination in a modest, if uncomfortable, thirty-six hours; Ra Mahleiné covered the same distance via shipping freighter, and had to endure four bleak years of travel, just meters above the slapping waves. This kind of Super Relativity is our introduction to their strange world, a backdrop against which the novel’s main plot unfolds. Soon after husband and wife settle into a cozy boarding house, Gavein finds himself unwittingly at the center of a bizarre string of deaths. Though none implicate him as a murderer, all are connected by the mysterious fact that, just prior to their passing, each victim crossed Gavein’s path in some way. Now considered Death, incarnate, Gavein and Ra Mahleiné face the steep task of investigating the very foundations for the laws which govern their world, in hopes that an explanation of Gavein’s role in these events might be revealed. This is how one does science—tracking down nature’s bright ideas […] because in science first you find the relations that join fact to fact, and then you try to simplify those relations as much as you can, in order to see the deeper sense in them. Zef is a hard character to dislike. He talks slang, curses his landlord, picks boogers, and then blows minds with startling mathematical insight. In him we catch a glimpse into those heady times following Einstein’s rise to prominence, when scientists the world over were calculating the motions of heavenly bodies with a shiny new toolset. Zef is not frightened by the mysterious deaths, but draws strength and inspiration from their baffling nature. “Behold what a powerful instrument is the ability to juggle constants in a formula,” he brags, God-like, after illustrating to Gavein an important equation. Gavein himself is a kind hearted and emotional foil to Zef, and is driven only by love for his wife. He is haunted by the knowledge of what Ra Mahleiné endured on the freighter, and so to distract her from their bleak situation, Gavein takes to reading from a strange book, titled Nest of Worlds. 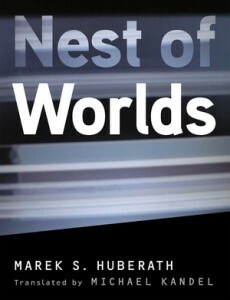 Though at first the reading is an act of escapism, Gavein discovers startling connections between his own life and this enigmatic book, which contains embedded fragments of various stories—each involving different characters, each set in a slightly different world, and each focused around the titular book, Nest of Worlds. She had been reading the book since her youth, but she still hadn’t got past the first fifty pages. The scenes and action developed on their own. The facts, the events, how their descriptions took on color—all that depended on your grasp of the meaning. A wonderful world exists inside my book, she thought with pride. […] She herself hated to have her reading interrupted, knowing that simply setting down the book put a halt to the lives of the heroes, to the life of a world. The elements of meta-fiction woven into Nest of World’s final turns are tantalizing to Gavein and Ra Mahleiné, but have an equally strong effect on a real-world reader. Injecting these alternate worlds brings the writing to a thrilling, feverish frenzy that I devoured in a single marathon session. Like Gavein, I plowed ahead in pursuit of deeper understanding. Huberath’s prose, translated into English for the first time by Michael Kandel, remains lucid throughout—even when explaining complex mathematical ideas or introducing brand new worlds and characters—which allows the reader, through its simplicity, to incrementally put the pieces of the narrative puzzle together. When finally the pieces do fall into place, we collapse back into the sad lives of Gavein and Ra Mahleiné, who remain totally isolated, surrounded by death, and deeply in love. But their ending has already been prescribed. All that remains of it is left to us: it is only our continued reading that forces the story’s dénouement. In making us complicit in the unfolding events, the somberness of the final pages is intensely intimate. It almost demands a long, quiet walk after finishing, in order to be fully processed. What Huberath has done in Nest of Worlds is play with our temptation to believe that the worlds we build from fiction are entirely our own—a private retreat somewhere in our mind, untouched by the often cruel natural laws which govern the real world. Einstein called this propensity to separate ourselves from our surroundings an “optical delusion of consciousness” that stifled empathy. Just as it does with his groundbreaking discovery about the relativity of time, Nest of Worlds takes this fascinating temptation and re-imagines it, writ large across all levels of individual and society. In doing so, we see that pure, essential strain of science fiction, where the characters, narrative, and reader—giddy and weightless—careen forward toward discovery. Cory Johnston is the Books Editor of The Literary Review.